People who habitually interrupt others in meetings must be fairly common, because I'm often asked about what to do about them. And you can find lots of tips on the Web, too. Some tips work well, some generally don't. Here are my thoughts about four more. 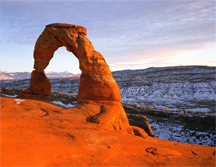 Delicate Arch, a 60-foot tall (18 m) freestanding natural arch in Arches National Park near Moab, Utah. Arches, whether natural or human-made, cannot be interrupted. Remove any part of an arch, and it falls. So it is with contributions in meetings. If a contribution is interrupted, it might resume, but if it does resume, we cannot know for certain that its content is the same as it would have been if it had not been interrupted. And even if the content is the same, it might land differently with those listening, because they, too, must deal with the interruption. Interruptions — potentially — change everything. Photo courtesy U.S. National Park Service. When you search the Web for tips about how to deal with people who chronically interrupt their peers at meetings, beware. Some tips work some of the time, and some do carry risks of their own. Here's Part III of some thoughts about commonly offered tips. See "Chronic Peer Interrupters: I," Point Lookout for May 30, 2018 for Part I. If chronic interrupters abruptly break into the conversation too often, they eventually create general resentment. So they must be clever. In one tactic, they use "interruption wedges" when they want to break in, because taking the floor from that point is less likely to arouse ire. One possible interruption wedge is ambiguity on the part of the person being interrupted. Anything that's somewhat unclear can serve. For example, suppose that the person about to be interrupted is describing a conversation with two males, Jim and Jeff, who together represent a vendor organization. Saying, "He said it would be delivered next week," could invite the interruption, "Who said, Jim or Jeff?" Pronouns are very handy interruption wedges. Avoid them. Also, avoid non-specific relative dates, like "next week," or "week after next." Say, instead, "Week of 12/3." Instead of "9 AM tomorrow," say, "9 AM Pacific time, tomorrow, Friday." If you're in the presence of a chronic peer interrupter who uses ambiguity wedges, it pays to be disgustingly specific. A crisp, direct delivery, trimmed of redundancy, detours, and other extras is less likely to be interrupted for two reasons. First, if you become known for being concise and to-the-point, people tend to listen up. Then, when chronic interrupters interrupt, they're more likely to look foolish, abusive, or rude. Second, because concise contributions are short, the time available for interrupting is short. Interrupting a short contribution is difficult because the interrupter must act quickly. wedges. Avoid them.consistently concise is tricky at first, but practice helps. After each meeting make a list of all your contributions, or anyone's contributions, verbatim if possible. Then rewrite them in fewer words. You'll get better at it. An oft-recommended technique involves speaking last — waiting for nearly everyone to speak before making a contribution. The hope is that by that point chronic peer interrupters will have had all the opportunity they need to speak, and therefore they'll be less likely to interrupt someone who has waited politely for some time. This tactic can backfire. In effect, using it might be conceding the floor to the interrupters. But the real problem is that chronic peer interrupters do what they do not merely because of the need to contribute their ideas, but because interrupting others is an expression of power or dominance. Whenever someone else is speaking, the chronic peer interrupter must listen. In that situation, the power stances are inverted with respect to the favored configuration of the chronic peer interrupter, who then feels the need to "fix" the situation by interrupting. If you surf around a bit, you can find recommendations that introducing your contribution by setting expectations can prevent interruptions. For example, you can start with "This is a complex argument, but bear with me," or, "I have just three points to make," or, "Give me just two minutes to lay out this story," or, "The last thing I'll add is…" or something analogous. Beware, though: long intros describing the structure of the contribution you're about to make can seem arrogant or condescending to some. But this technique works well if you're the recognized expert on the topic in question. Otherwise, in addition to condescension risk, it's vulnerable to itself being interrupted, because it gives the interrupters information about where you're going. And the assumption that chronic interrupters interrupt because they're unaware of how long you need to make your points isn't always correct. Chronic interrupters engaged in power or dominance displays are likely more concerned with displaying dominance than they are with whatever it is you have to say. Would you like to see your comments posted here? rbrenvdZFGXzEJRbYeCVJner@ChacsancKTJzejGbPWmnoCanyon.comSend me your comments by email, or by Web form. Creative thinking at work can be nurtured or encouraged, but not forced or compelled. Leaders who try to compel creativity because of very real financial and schedule pressures rarely get the results they seek. Here are examples of tactics people use in mostly-futile attempts to compel creativity. When making contributions to meeting discussions, we're sometimes interrupted. Often, the interruption is beneficial and saves time. But some people constantly interrupt their peers or near peers, disrespectfully, in a pattern that compromises meeting outcomes. How can we deal with chronic peer interrupters? See also Effective Meetings and Effective Communication at Work for more related articles. I offer email and telephone coaching at both corporate and individual rates. Contact Rick for details at rbrenDfTnhzlWlBffxgjKner@ChacThYDQrghCHsiGjLMoCanyon.com or (650) 787-6475, or toll-free in the continental US at (866) 378-5470.